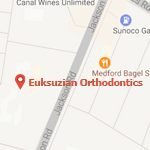 At Euksuzian Orthodontics, we’re proud to offer top-quality orthodontic treatment to patients of all ages throughout the Moorestown & Medford, NJ area. Our offices use advanced medical technology to provide expert treatment for a wide variety of conditions, and as a leading orthodontic provider in the greater Moorestown and Medford areas, we’ve helped countless patients achieve impeccably beautiful smiles. We’re proud to offer world-class care at our offices, and we’re equipped to handle virtually any orthodontic problem. While a few people are fortunate enough to have their teeth grow in perfectly and not need orthodontic treatment, for most people, orthodontic treatments like braces and Invisalign are the best way to achieve a beautiful, healthy smile. 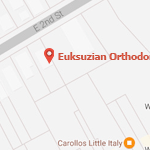 There are a number of common orthodontic problems, also called malocclusions or “bad bites,” and Dr. Sarkis Euksuzian is an expert in treating all of them. In this malocclusion, the upper front teeth jut out too far past the lower front teeth. This problem can affect speech and bite function, and it also puts the teeth at an increased risk of damage from chipping or trauma. In this condition, the upper jaw extends past the lower jaw and prevents the teeth from fitting together correctly. In severe cases, patients may have their lower jaw bite into the roof of the mouth. The reverse of overbite, this condition is marked by a lower jaw that extends out forward past the upper jaw. This can impair chewing, bite function, and speech. In crossbite, the lower teeth rest outside the upper teeth. This can cause tooth stratification and impair healthy jaw growth, often leading to TMJ later in life. Openbite is sometimes caused by maladaptive habits like tongue thrusting or prolonged thumb sucking. It’s a condition where the upper and lower teeth don’t meet when the mouth closes, often impairing speech and bite function. Crowding occurs when the dental arch doesn’t have sufficient space for the teeth, causing them to grow in crooked. We can correct this problem with early orthodontic treatment, using a device called a palatal expander to gently, painlessly widen the jaws and create more room for teeth. Spacing issues occur when there are large gaps between the teeth. Spacing problems may only be a cosmetic issue or they may present functional problems. In this condition, the back bite doesn’t fit together properly, impairing jaw growth and regular dental function. Without proper treatment, any of these problems can have a serious, lasting impact on your smile and your life – but Euksuzian Orthodontics is here to help. We’re proud to provide expert orthodontic care to patients of all ages, and if you’re interested in starting orthodontic treatment for yourself, we’d be thrilled to speak with you. Reach out to us at our contact page with any questions or book your consultation using our easy online form. We’ll work with you to provide the top-quality care you need so you can achieve the smile you deserve.